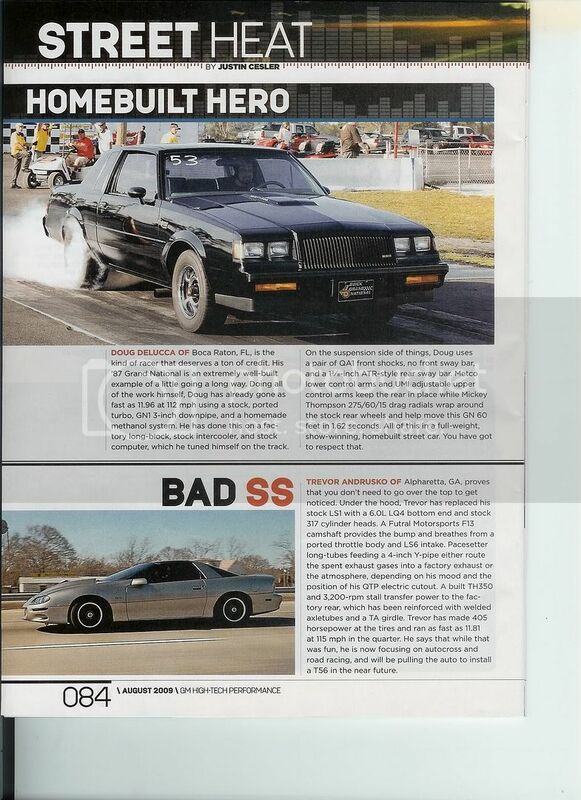 A small update, got some magazine coverage for going 11's. Nice write up, thanks for sharing that and congratulations! Really nice write up and congratulations on achieving your 11 second goal, but may I ask what was your motivation? Looking at your sig, was this your most recent combo? I see you have a couple of others listed. No offense, but it seems like a lot of work and down time to go slower. No offense taken. The car really hasn't been good too me in 2010. In Jan of this year I finally blew the stock head gaskets and decided to go roller cam and port the stock irons. Had the car up in April and a methanol incident decided the fate of the two front stock pistons. I got it back up and running with a fully forged bottom end in Oct and started fighting false knock issues, a cracked front mount and melted spark plugs. The car is finally getting back up to where I had it. The new combo I'm shooting for 10.3x's @ 130 ish. We'll see. Note to self...when responding to a multi paged thread it's wise to check the initial posting date. I saw another thread today you started when you ported your heads I think, it clued me in that this thread preceeded it. At any rate, very nice attention to detail here. Congratulations again.